This post is so long overdue! I’ve written once about the Tween Book Club I run at my library, but I really should take more time to share the books and activities we do each month. I’ve got a solid group of 12 kids who show up to every meeting, and we’ve been having a great time. 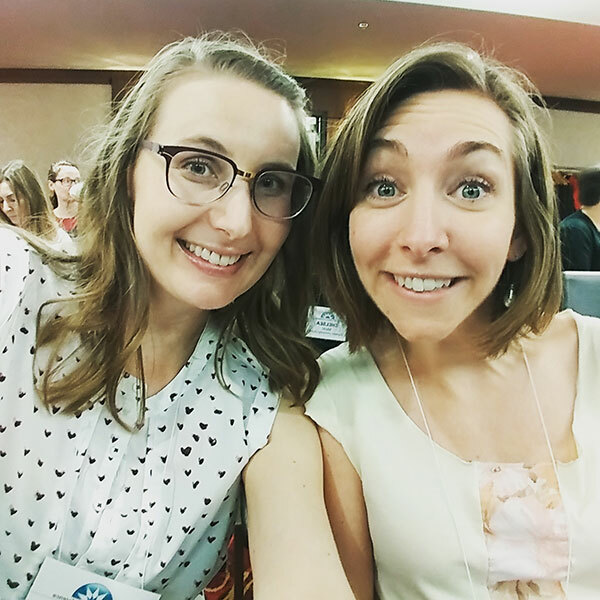 I think I’ll make this a blog series and write up posts on icebreaker activities, how to encourage discussion, and places you can find other resources. For now, I thought for I’d share some quick and easy meeting ideas. The first 20-25 minutes of each meeting is the same. We do an icebreaker activity and then we discuss the book. I will write more about each of these activities in my future posts, I promise! For the second half of the book club, we do some sort of extension activity that is thematically related to the book. I try to vary the type of activity because the tweens all have their own personalities and preferences, and I also aim for fun and laid back options. 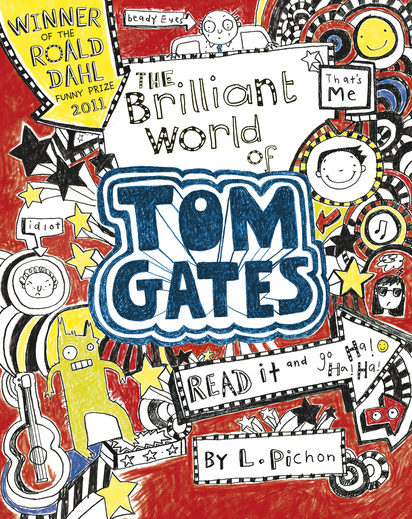 Here’s a list of the books we’ve read and the matching extension activities. We did two activities for this book. First, because there is lots of magic in the story, I showed the kids three different card tricks and they had to work together to see if they could solve them. Then two kids demonstrated card tricks of their own. 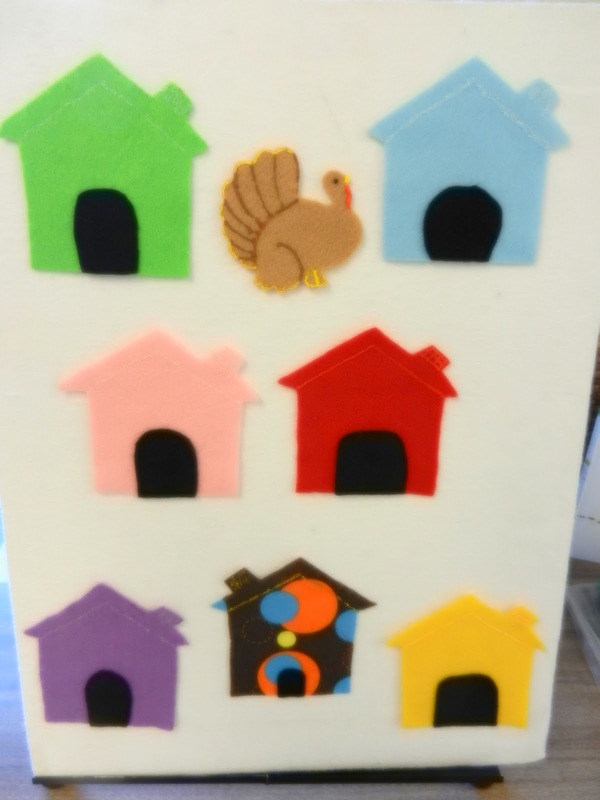 Secondly, we did a window decorating craft. 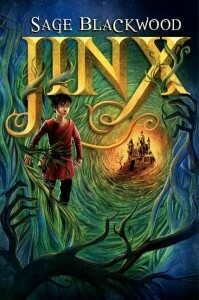 I loved the setting of this book, a magical forest called the Urwald. 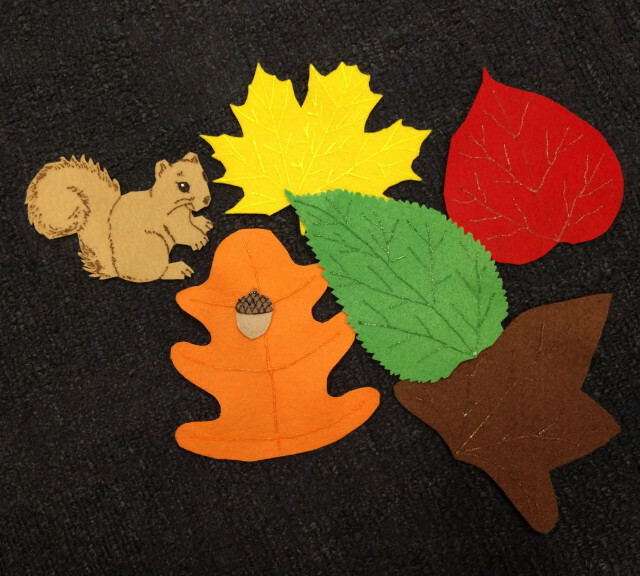 Using large pieces of black construction paper, we cut out trees and creatures that reminded us of the book. 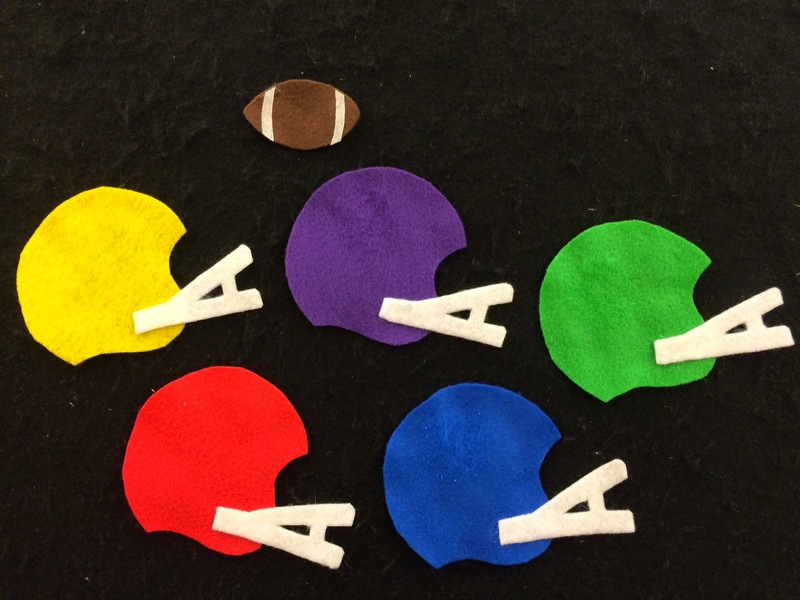 Then we taped them to the library’s windows creating a shadow display. Here’s a Halloween example of what the final result looked like. 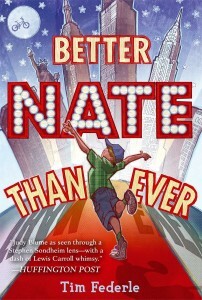 As I was reading this book I kept thinking about the theme, “Things aren’t always what they seem.” So for our first activity I printed off a bunch of funny pictures (the ones I chose were all tween appropriate), and had the kids discuss what was really happening. Much laughter ensued and this led us back to talking about the book. 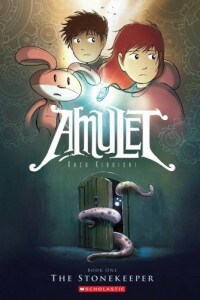 Next, we played an Amulet themed version of “Would You Rather?” I had about 10 pre-written scenarios, and the kids each wrote down two of their own. Again, lots and lots of giggles. This book takes place in Vancouver so I knew I wanted to do something about neighbourhoods and maps. I printed some maps of the Kitsilano and Granville Island areas and we marked off the places that Ambrose visits. And then of course we played a team round of Scrabble which the kids loved so much they asked me if we could play it every month! We talked a lot about autism and disabilities during the discussion part of our meeting today, so for the activity I brought out Pictionary. 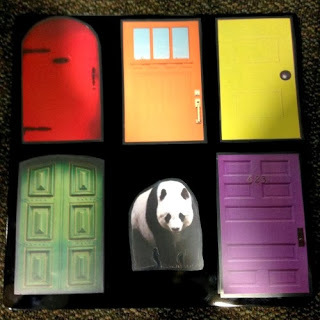 A character named Jason in the book communicates via picture cards, and I thought this game would be an interesting way for the kids to see what that would be like. I have a pretty outgoing group of kids so I knew I could get away with doing a bunch of theatre games. 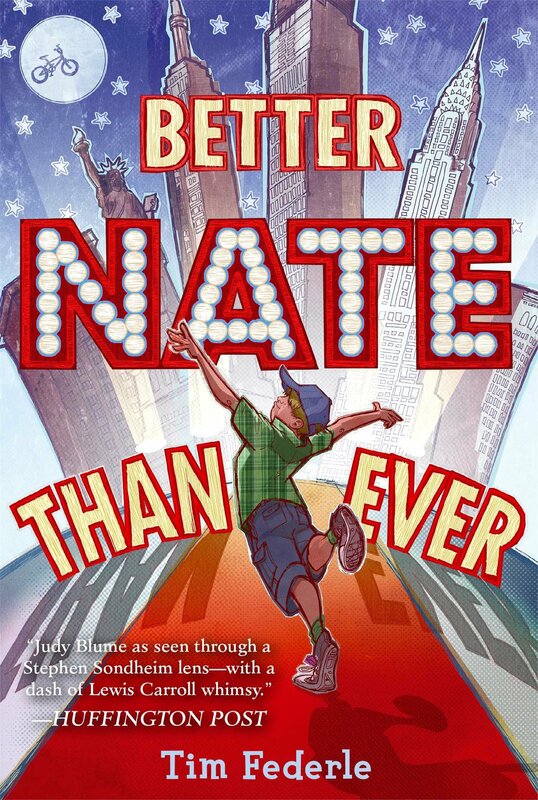 The main character, a kid named Nate, tries out for the Broadway musical version of E.T. and he’s asked to show off a special skill. So we started from there! After that I pulled 4-5 games from different online resources I found and we all channeled our inner Nate. 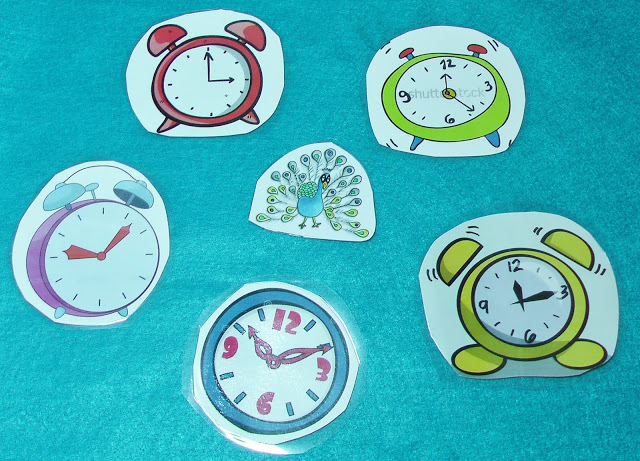 This works even better if you can scrounge up some props for the kids to use. 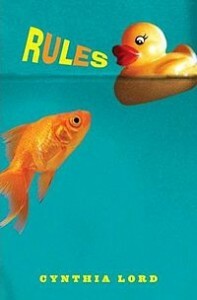 This book takes place in England, so the characters say lots of British sayings that my tweens were unfamiliar with. Thankfully, the author includes a glossary at the end with definitions of the words. I created a quiz based on her list and the tweens tried to remember what each word or phrase meant. 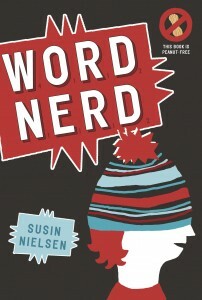 The tween with the most correct answers won a free book. Usually I try to stay away from “school-like” activities, but this was more of a contest and the kids loved the competition aspect. Next, I found this fun drawing activity on the author’s Tom Gates blog: grab some bananas and some pens! I took pictures of their drawings and hung them up in our meeting room. 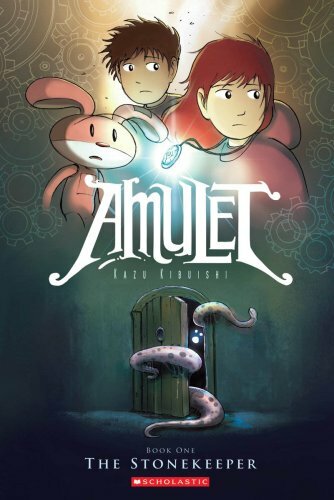 If you hadn’t already noticed, my tweens are obsessed with graphic novels. For our first activity, I printed out pictures of every single character in the book and hung them up around the room. Then I gave kids about 5 minutes to go around and write down one word that best describes each character next to their picture. 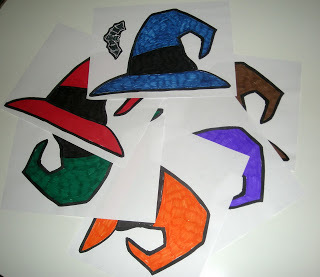 We had a lot of fun with this activity and I had each tween present one of the characters when we were done. Next we spent time trying to create our own graphic novel panels. I knew some of the kids would struggle with a blank slate, so I brought out lots of magazines and discarded books. Anyone who didn’t want to draw their own could cut out pictures and assemble them instead. I tried something different this month and pulled three different graphic novels/manga that take place in space or on another planet. 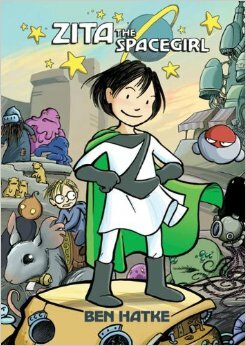 They are Zita the Spacegirl by Bet Hatke, Astronaut Academy: Zero Gravity by Dave Roman and Twin Spica by Kou Yaginuma. I hadn’t done a craft activity in awhile so I collected a bunch of small cardboard boxes and we made these alien creatures and placed them on top of the science section in the juvenile non-fiction collection. Any time our activity leads to decorating the library in some way, the kids get really into it! So that’s what I’ve been up to in my Tween Book Club. 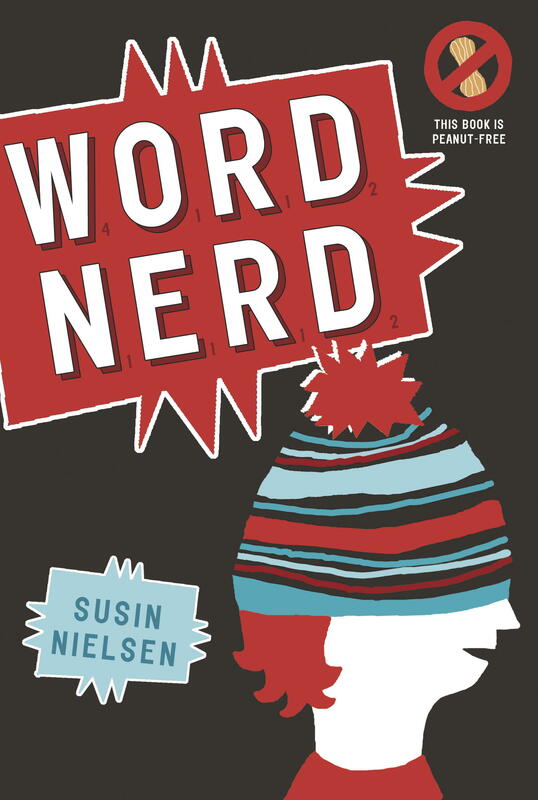 Do you run a Tween Book Club? I’d love to hear about the books you read and the activities you do at your meetings! 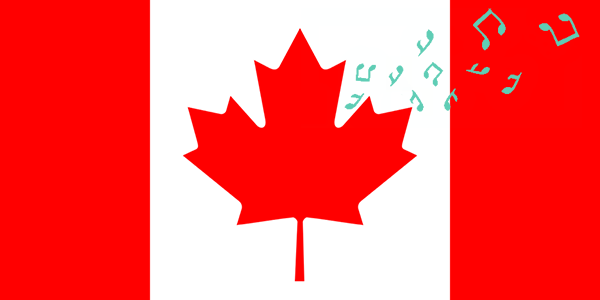 Last month we put a call out for Canadian Youth Services Library content, and we have been overjoyed at the response! 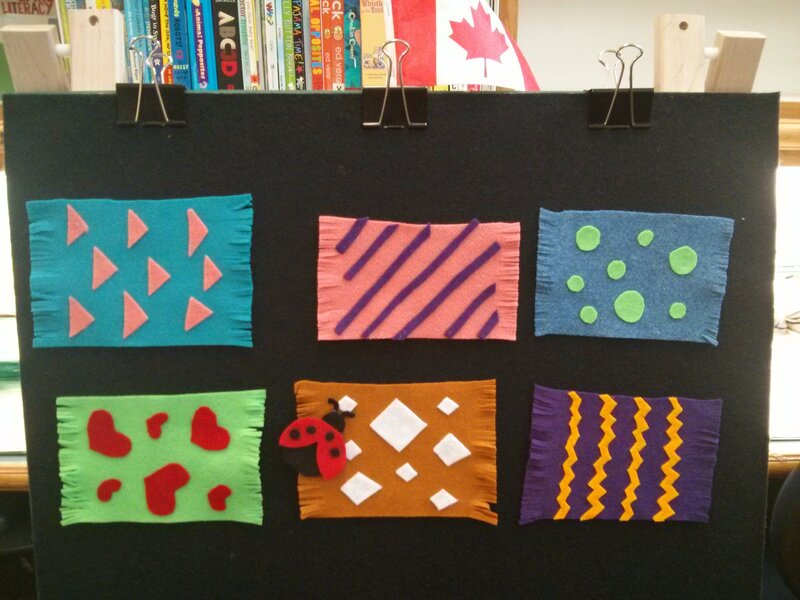 This post is the first in our guest post series highlighting the amazing work being done in Canadian libraries to serve children and families. Our guest blogger is Rose Reid, library manager of Bighorn Library in Bighorn, Alberta. Take it away, Rose! 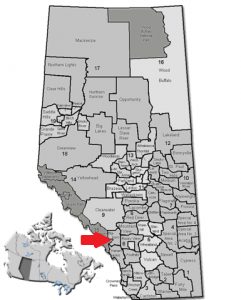 Bighorn Library serves the MD of Bighorn in the beautiful Rocky Mountains of Alberta. 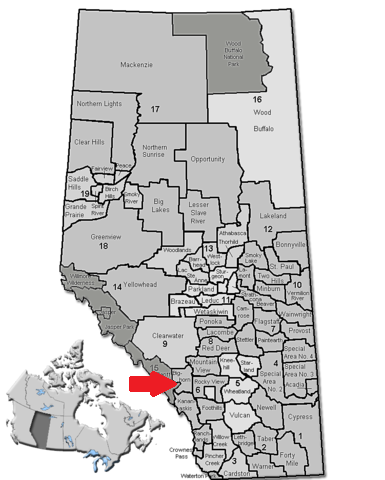 We are situated in the hamlet of Exshaw, population 417. Our library has been a member of the Marigold Library System for 34 years. I’ve been the librarian for the last 20. One of my favourite parts of the job is serving children; look us up on YouTube to see some of our favourite ideas! Our closest neighbor, Exshaw School, is only a couple of blocks from our library and teaches grades kindergarten through eight. 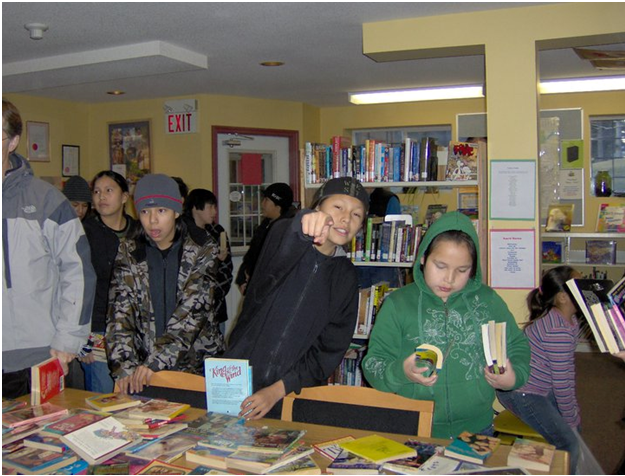 About 90% of the student body are First Nations children and it was these young library members who inspired us to create Bonnybooks. 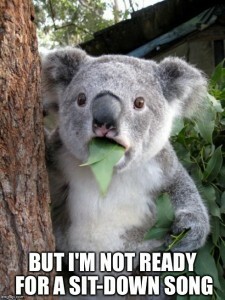 My assistant was volunteering at the school as a literacy coach and she told the 7-year-old she was working with to be sure and practise reading at home that weekend. He looked at her like she was crazy and said, “I ain’t got no books at home.” It turned out that there were no books in many of the homes on the Morley reserve and we started looking for a way to remedy that. It began with the books we weeded from our library shelves. 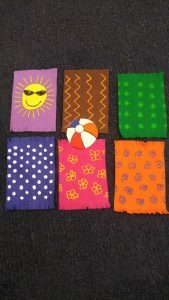 We would rescue any that were still usable and when there were enough for every child in a class we would go to the school and give them to the students to take home. I don’t think it is possible to describe how excited those children were to own books. It was so much fun, the more we did it, the more we wanted to do it again. Do you work with toddlers? If so, there’s a very high chance that you’ve done the Little Mouse, Little Mouse, Are You in the (Colour) House? rhyme. Because it’s toddler gold. But maybe you’re a little tired of Little Mouse or maybe you’d like to model to caregivers how to adapt and evolve rhymes. Either way, I’m here for you. 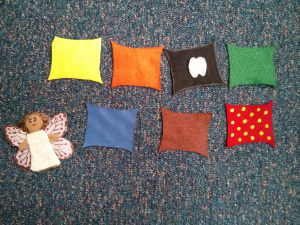 I looked through all 5,000+ of Flannel Friday’s pins and found some excellent renditions of Little Mouse. 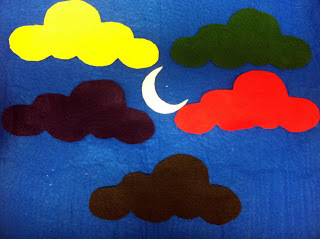 And I’m excited to try some of these versions with my storytime toddlers! Before I begin, if you’ve never heard of Little Mouse (which was me a year ago) or have always wondered how to actually do it with kids, this video by KCLS is a must watch. If you want to go beyond Little Mouse, try one of these adaptations! I’m starting it off with my Flannel Friday submission. 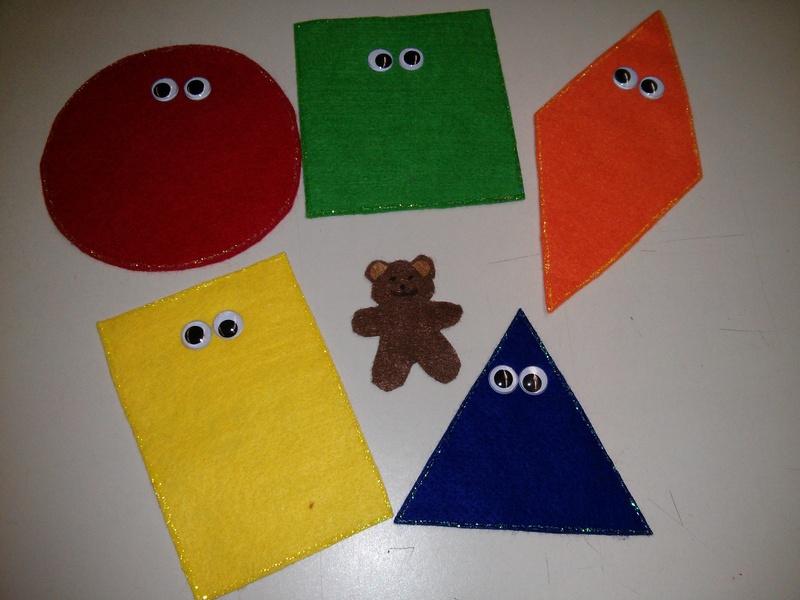 I got the idea from With Kiddos @ the Library who shared a bear version that goes “Little bear, little bear, are you hiding under there?” I used the shapes from an already existing Flannel set (Red circle, red circle, what do you see? ), so all I had to make was the little teddy bear. I used the felt template found here because it looked easy enough to make. Can’t wait to try this out next week! 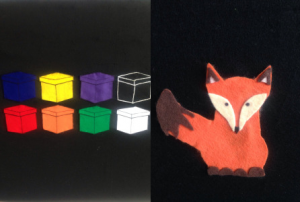 From erinisinire, try “Little fox, little fox, are you in the (colour) box?” Gah, that fox is the cutest thing ever! Erin is the one inspired this post and I think toddlers would love her fox friend. 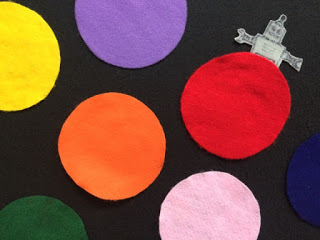 Go read her post because she also incorporates counting into the game and a wonderful early literacy tip for caregivers. From Thrive After Three, try “Dinosaur, dinosaur, are you behind the (colour) door?” I like how this one changes the preposition. Plus toddlers are all about dinosaurs! As a flannel novice, I am always looking for pieces that aren’t intimidating to make and these doors are right up my alley. 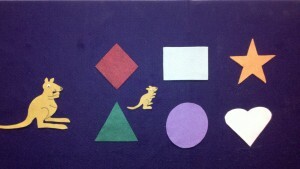 From Falling Flannelboards, try “Baby kangaroo, baby kangaroo, where are you? Are you behind the _________?” Erin made this for an Australian Animals themed storytime, but I think it’s great to expose kids to more than the usual farmyard standbys. 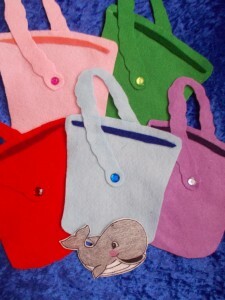 And you can add in an early literacy tip about how learning shapes is the first step to learning letters. 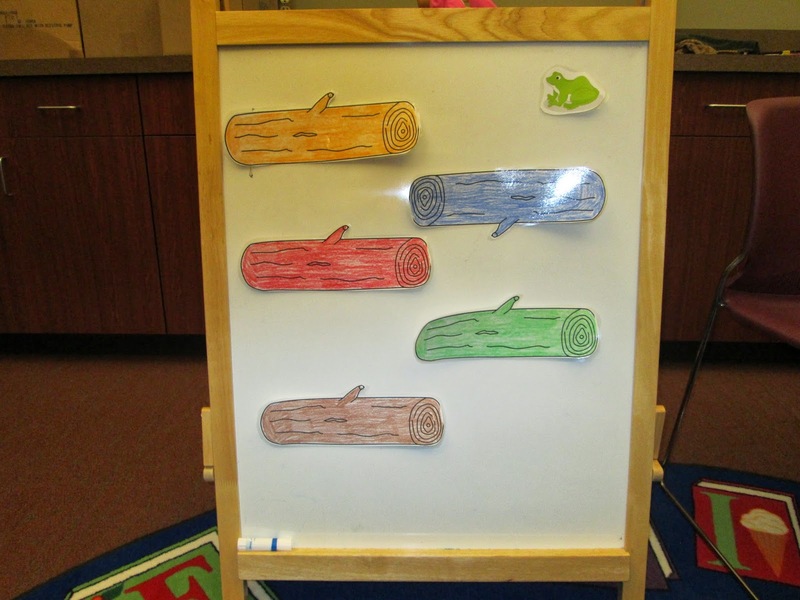 From Miss Kelly at the Library, try “Little frog, little frog, are you under the (colour) log?” Another nice change of prepositions and as Kelly points out it’s perfect for April, National Frog Month in the U.S. Or pair with “Five Green and Speckled Frogs” for a Frog themed storytime. 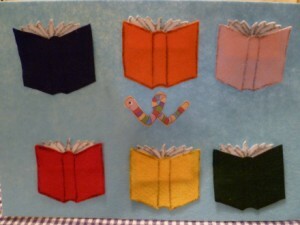 From itsybitsymom, try “Wiggleworm, wiggleworm hiding in a book. Wiggleworm, wiggleworm where should we look?” Perfect for sharing during a library themed storytime, and great way to introduce the term “bookworm.” Can you say print motivation?! Lady Librarian’s Literacy, Lifestyle, and Lookbook Log shared a similar rhyme that goes, “Bookworm, bookworm, where should we look? 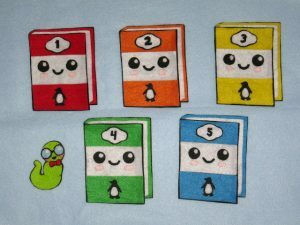 Are you in the (colour) book?” She also added numbers for an additional early literacy element. The Little Cat, Little Cat rendition is probably the second most popular form of this game. 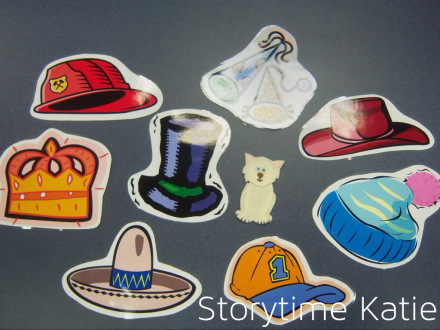 It goes, “Little cat, little cat, are you under the (colour/type) hat?” Starting from the left, Storytime Katie shows you how to transform Microsoft clip art into an eclectic array of hats. 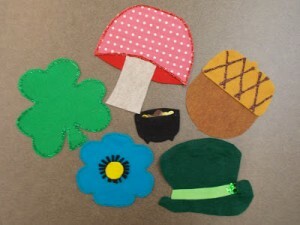 In the middle is Miss Mary Liberry with her hand drawn hats which she uses to talk about the people who may wear them. 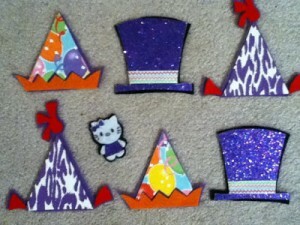 On the right is Piper Loves the Library with her party hat version that stars a Hello Kitty look-alike and would be perfect for a birthday storytime. 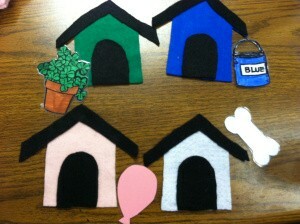 From LibrErin, try this dog version based on a popular children’s literature character. 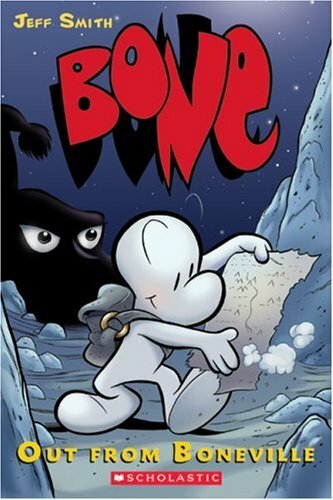 It goes “Clifford, Clifford where is your bone? Did someone put it in your (colour) home?” I like how there is something else under the other houses because it could lead to lots of good discussion with the kids. 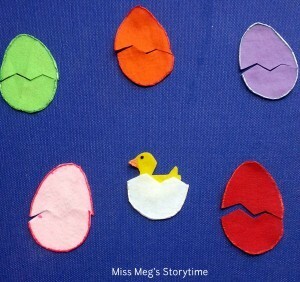 From Miss Meg’s Storytime comes the Knock Knock Baby Duck game. It goes “Knock, knock, knock, baby duck, baby duck. Are you behind the (colour) egg?” I love how the eggs are cracked in two because you could really build the suspense. 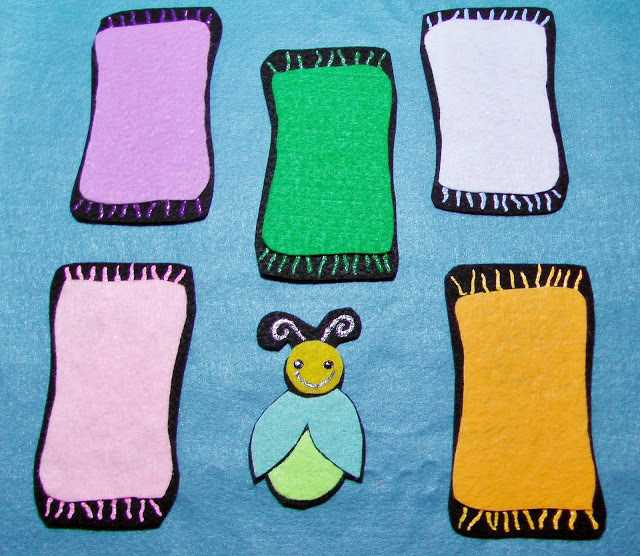 BONUS FLANNEL: She also has an adorable butterfly and caterpillar version. Piper Loves the Library just posted this duck version that has lots of cool construction vehicles. 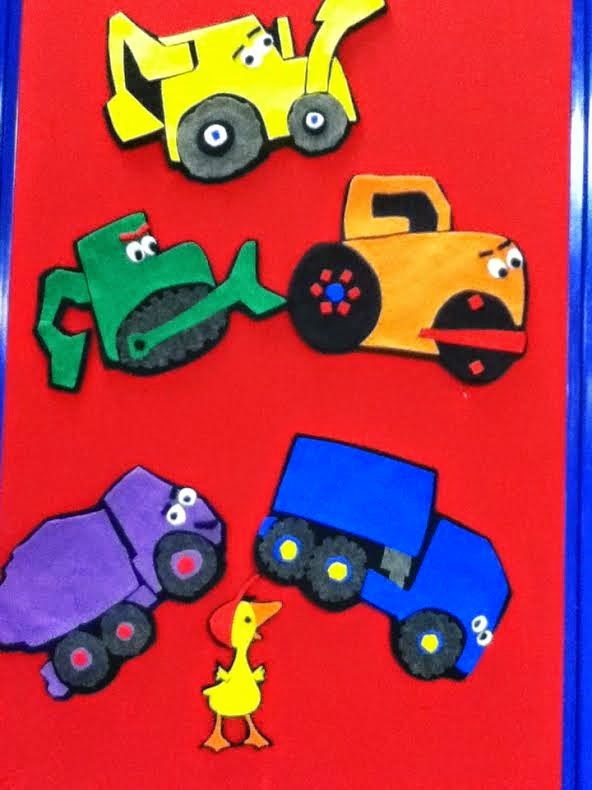 It goes, “Little duck, little duck, are you in the (colour) truck?” I bet there are lots of little ones who can tell you all the specific names of the trucks too. Like me, she reused some flannel pieces from a different set making this one easy to pull together. On RovingFiddlehead KidLit you can find this construction themed version based on Bruno the Carpenter by Lars Klinting that goes, “Bruno needs his hammer lots and lots. 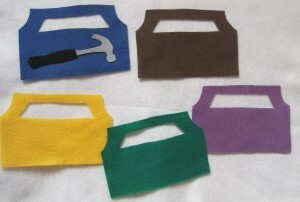 Is it hiding in the (colour) toolbox?” I could imagine making different tools and using this one again and again. Over on So Tomorrow, you can find not one, not two, but THREE versions of this game. 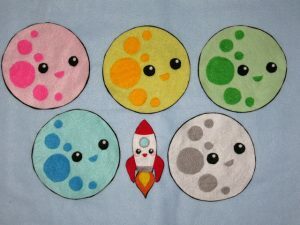 Perfect for a bedtime or pyjama storytime, try the Little moon rendition which goes, “Little moon, little moon, are you behind the cloud of (colour)?” During the winter months (now! 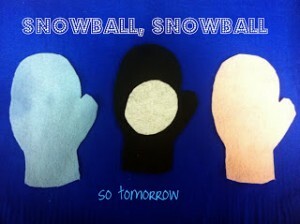 ), the Snowball, Snowball version is a perfect game to play: “Snowball, snowball, cold and round! Behind which mitten can you be found?” Lastly, try this Little Worm one that goes, “Little worm playing hide and seek, are you under the (name of fruit)? Let’s take a peek!” I love how all of these look easy enough to whip up in one afternoon. 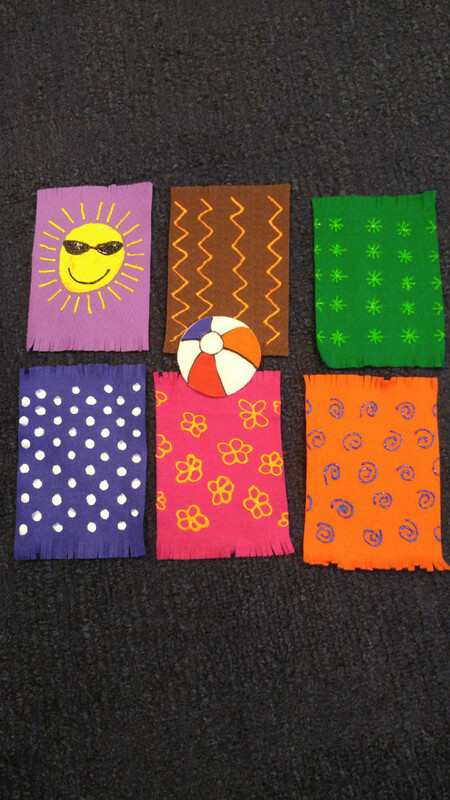 This summer version comes from Fun with Friends at Storytime. Staring the happiest little whale you’ve ever seen it goes, “Little whale, little whale, are you hiding in the (colour) pail?” Anyone who can make 3D felt pieces is one of my heroes. 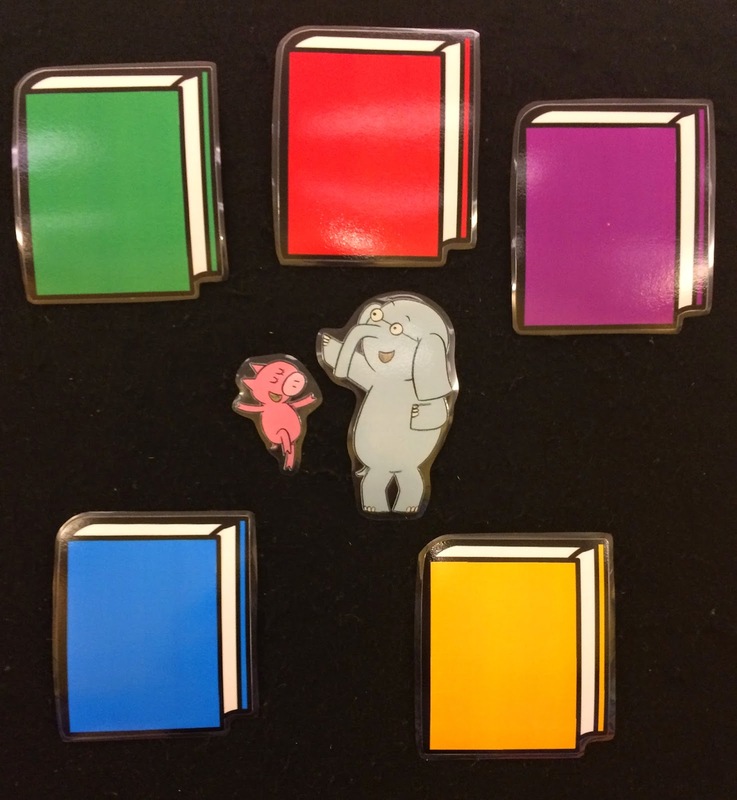 The Librarian is on the Loose has shared multiple versions on her wonderful blog. First she shared a tooth fairy version. I love it because people actually hide teeth under pillows so it will make sense for those literal-minded toddlers. Also, that tooth fairy is really cute! The rhyme goes, “Look and see! Look and see! Can you find the tooth for me? Is it under the (colour) pillow?” You can find similar versions on Adventures in Storytime (and Beyond) and SLC Book Boy. She has also shared an adorable fall-themed version featuring a squirrel and a summer-themed version featuring a beach ball. 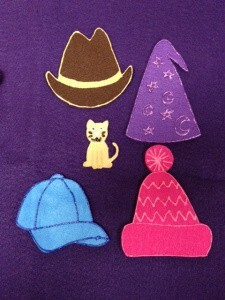 Perfect for seasonal storytimes! My wonderful co-worker Miranda emailed these pictures after reading this blog post. 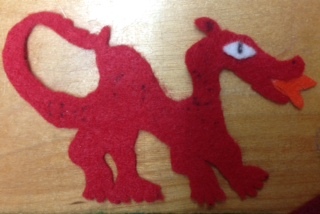 She made this dragon version for a Lunar New Year themed storytime, and I’m in love with them. 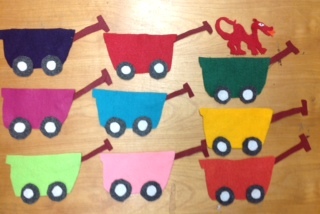 The rhyme goes, “Little dragon, little dragon, are you behind the (colour) wagon?” Thank you, Miranda! Here’s another holiday version that comes from Fun with Friends at Storytime. The rhyme is an original and goes like this, “Do you feel lucky? Let’s be bold! Let’s see if we can find the leprechaun’s pot of gold.” You could work in lots of good vocabulary with this depending on the items you make. 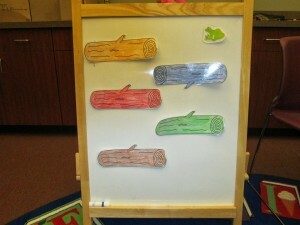 I saw this version on a preschool learning blog called PreK + K Sharing. 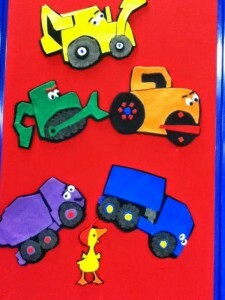 Do you read preschool blogs? I need to read more; they are a great source of ideas and inspiration. This one goes, “Turkey, Turkey come out and play. 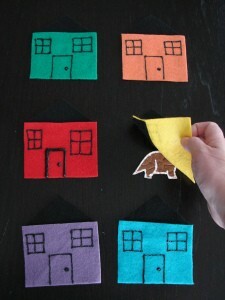 What color house are you in today?” And you can sing it to the tune of Twinkle, Twinkle! Don’t have a turkey? 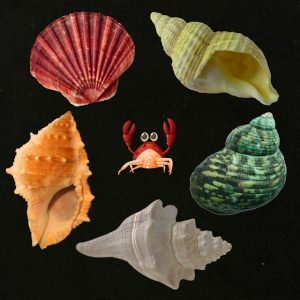 Swap in any two syllabic animal. Our friend Emily made this FABULOUS hiding game similar to Little Mouse that is all about letter recognition. Behind each door is a different animal. They say this rhyme, “We’re looking for an animal that starts with [“P”] and we won’t stop ’til we find it! Now, let’s give the [RED] door three sharp knocks and see who hides behind it! KNOCK! KNOCK! KNOCK!” Then they practice saying the sound of the first letter of the animal. This is genius! Need a holiday version? Shawn at Read, Rhyme and Sing shared this super cute jingle bells idea that goes, “Jingle bells I hear you play. 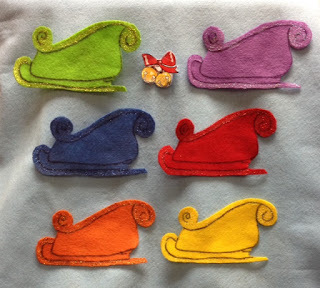 Are you under the (colour) sleigh?” Great for the winter! 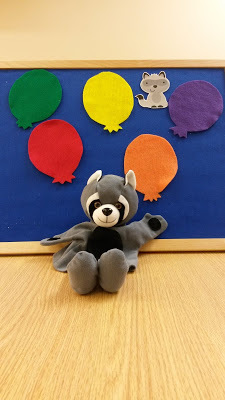 Amy at One Little Librarian has an adorable baby raccoon version that includes multi-coloured balloons and a mama raccoon puppet. Her rhyme goes, “Baby Raccoon, Baby Raccoon, Are you hiding under the red balloon?” It ends with a sweet racoon hug. 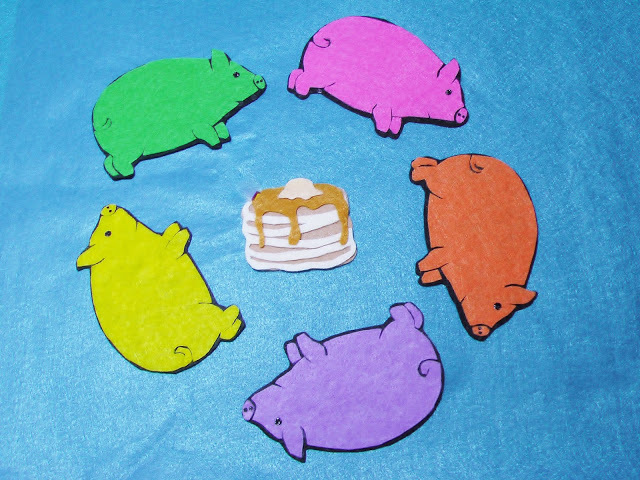 Shawn at Read, Rhyme and Sing shared this adorable (and easy to make!) robot and dot version to celebrate International Dot Day. It goes, “Robot, robot, are you under the (colour) dot?” I love it! 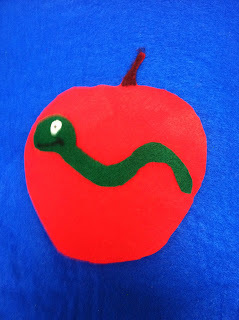 Storytime in the Stacks shared this birthday cake version featuring a fanged snake. It goes, “Mr. 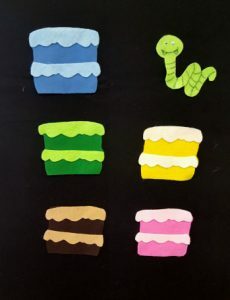 Snake, Mr. Snake, are you behind the (colour) cake?” I think it would be so fun to ask kids what flavour each cake could be. Do you have a version I missed? Let me know in the comments and I’d be glad to add it in!